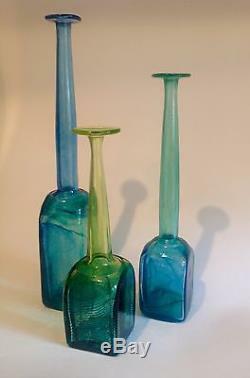 STUNNING LARGE COLLECTION LEIF VANGE SCANDINAVIAN GLASS BOTTLES / VASES. 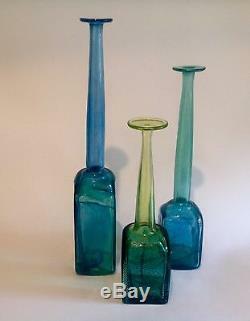 RARE ART GLASS Tallest is 33cms tall! And all pieces signed and dated on base by artist himself. This vintage collection of Art Glass would make a striking collection and one which will undoubtedly become even more collectable and therefore valuable with time. The elegance of these vases with long necks and flattened mouths makes them most unusual and speaks of the skill of the artist. 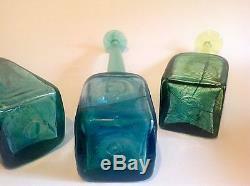 They are in colours of aqua, dark blue and lime. 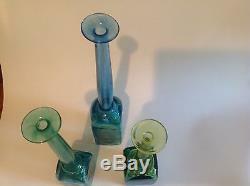 They are all in excellent vintage condition with no chips, cracks or repairs and are all signed and dated to the base. Dimensions: Height 33cms, 28cms, 22cms respectively. We have a selection of good collectable Modern Decorative Art and Mid Century Modern items for sale, so please do take a look and favourite us, so you can come back and visit us soon. 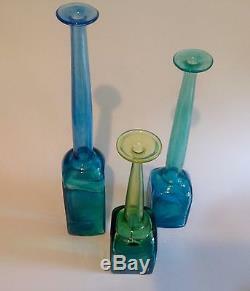 The item "LEIF VANGE 3X ART GLASS AQUA BLUE BOTTLES VASES SCANDINAVIAN TALLEST 33cm" is in sale since Friday, May 26, 2017. 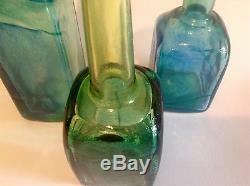 This item is in the category "Pottery, Porcelain & Glass\Glass\Art Glass\Scandinavian\Other Scandinavian Art Glass". The seller is "inscapesdesign" and is located in Cheltenham. This item can be shipped worldwide.